Due to the exploits of the Addicks on the pitch last season, one thing was guaranteed from Monday morning's announcement of the 2012/2013 fixture list, we weren't going to entertain Hartlepool's wonderful supporters for a third final day in a row. Or for that matter Bournemouth's on the opening day. Promotion has brought with it a change in names of the opponents that we seek out immediately the list is announced. Palace and Millwall are the obvious now, alongside the relegated clubs we saw on Match of the Day last season who will hope to be topping the Championship table come May. Boxing day, New Years day, birthdays, we all wish for fixtures that tie in with any plans already set in stone and you can bet your last pound they'll be one or two you were looking forward to that are hundreds of miles away and scheduled for a Tuesday night in January! The clubs are allowed to submit some special requests to the FA although 'we would like an easy run in to the season' probably doesn't count as justified. Charlton this summer made no such requests. This fixture list is still subject to changes and at the moment about as final as Stuart Pearce's long list for Great Britain's Olympic team. The police will no doubt require matches to be moved, Sky have yet to alter as many games as they are allowed from a traditional Saturday three o'clock kick off, and all this before the weather kicks in and pitches become frozen causing a fixture pile up come March. Birmingham City host us for the opening day of the season. A side that have Premier league aspirations, they were losing play off semi finalists last season and will be one of the favourites for promotion this time around. As we wait for an announcement as to the replacement of Chris Hughton in the Blues hot seat, we can romanticize about a possible meeting with former Charlton boss Alan Curbishley on August 18th. August is a traditionally hard month for me to attend games as every parent at work books the time off for the school holidays resulting in me often working full days on the Saturdays to cover. I'm grateful to see then that our first home league fixture is on the following Tuesday. Chris Powell's former employees Leicester City are the visitors. My next visit to The Valley after that could be mid September for Crystal Palace. Probably the first game i looked out for. 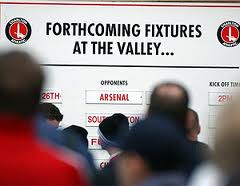 The return fixture at Selhurst is at the beginning of February. Millwall entertain on the first of December and visit mid March. I can't see The New Den being full of festive good will! Boxing day is a fixture i haven't been able to attend since i got married for fear of castration by the missus should i miss out on the family gatherings. I selfishly pray for an away fixture but alas this season I'll be missing the visit of Ipswich. I'll get my Christmas football fix three days later for Derby County's trip to SE7. At this level there won't be any easy games, but our run in does look tough with trips to Barnsley, Cardiff and Middlesbrough in April, not to mention the visit of two of last season's Premier League sides in our last four home fixtures. The full fixture list can be seen on the official club website. As mouthwatering as this main course is, we have the appetiser of pre-season friendlies first. Today we discovered that we'll face Sporting Lisbon whilst away on the training camp in Spain. This time away was invaluable last year as the new squad got to know each other both on and off the field. We faced two of this season's rivals, Cardiff and Bristol City, last time around. No disrespect to either of those two clubs but it's exciting this year to be facing not just foreign opposition but one of Europe's most famous clubs. A friendly against Fulham behind closed doors has also been confirmed which i have mentioned before here, along with a list of the other warm up matches. With everything now in place for the big kick off we wait to hear of any news in the transfer market. To date all we've got is contract extensions for Bradley Pritchard and Yann Kermorgant to get excited about but it's not really the same as a new name to the squad list. Perhaps that will all change after the European Championships and England's historic semi final win over the Germans. Revenge for 96.